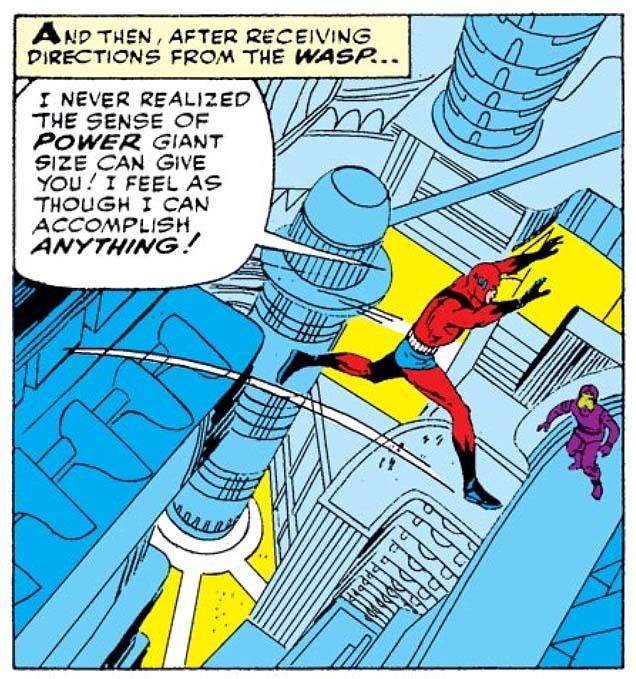 This is from the first panel of Giant-Man's debut. Smashing entrance, eh? As with Journey into Mystery #97, which came out the same week, such changes are heralded in true style - with the return of the team of Stan Lee & Jack Kirby! 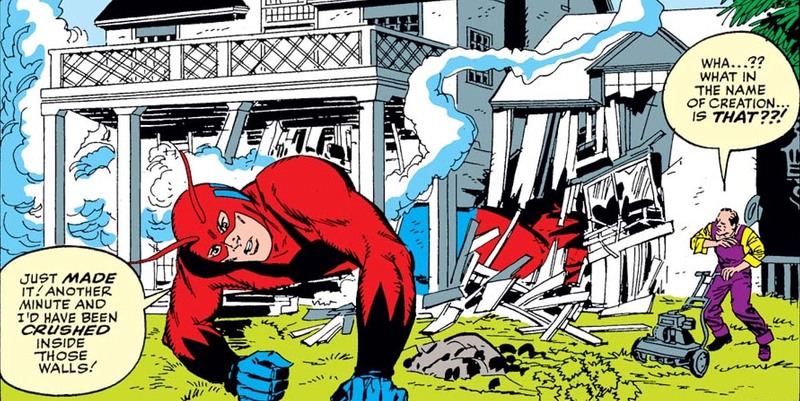 Jack hasn't been seen on the strip since issue #40, after which he was supplanted by Don Heck (a jarring change at first, but one I quickly took a shine to). 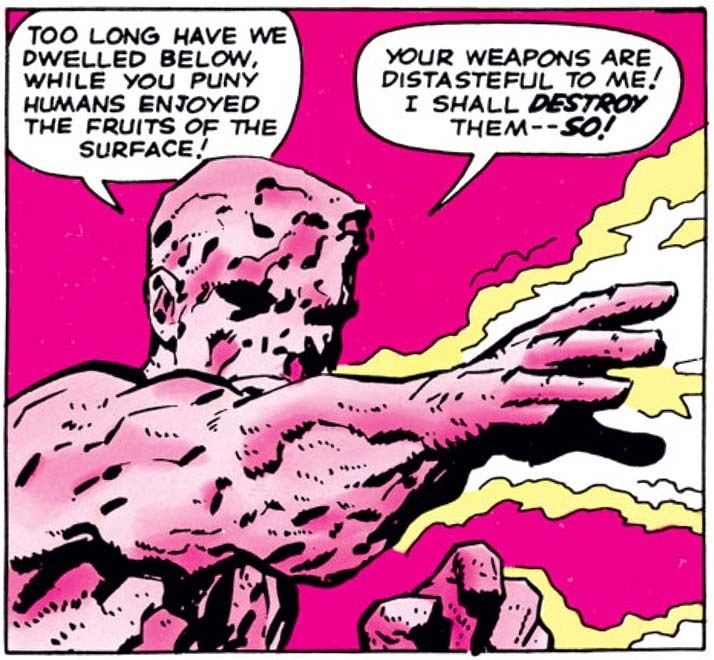 Kirby's just on board for the next few issues, but hopefully that will have been enough to work his magic. By contrast, Stan Lee is now providing plot and script here, for the first time ever - just like on Thor - and it will stay that way through almost the entirety of Giant-Man's run. I'd wonder if he always had such markings on his wall ... but c'mon. 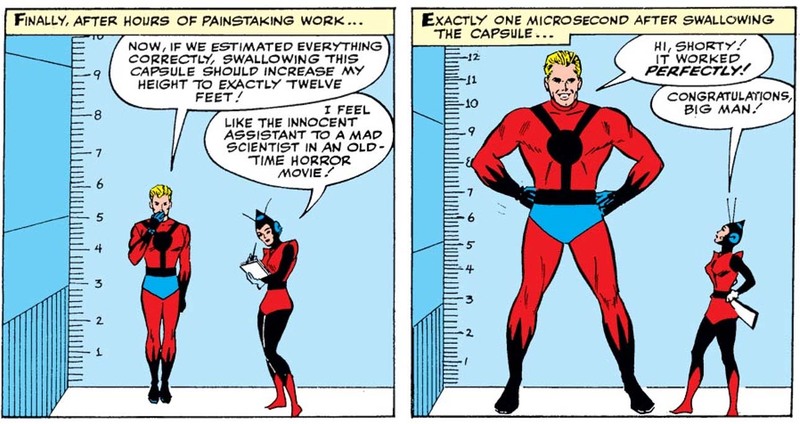 This is Hank Pym. Of course he did! The villain for the story is The Living Eraser, and you have to admire the simplicity of design: from the cover alone, it's abundantly clear not only what he does, but how he does it. And a callback to our old friend Paste-Pot Pete is in order! As with that wonderfully ridiculous villain, even a cursory examination reveals that this is a character who came about simply because of an ordinary function that's used in the creation of comics, and thus would have been in front of the artist every day. The most common question any writer or storyteller gets asked is invariably "Where do you get your ideas?" Sometimes the answer is just staring you in the face! That's the last time this hot dog vendor sells his wares in a random field! Here begins the reign of Stan! 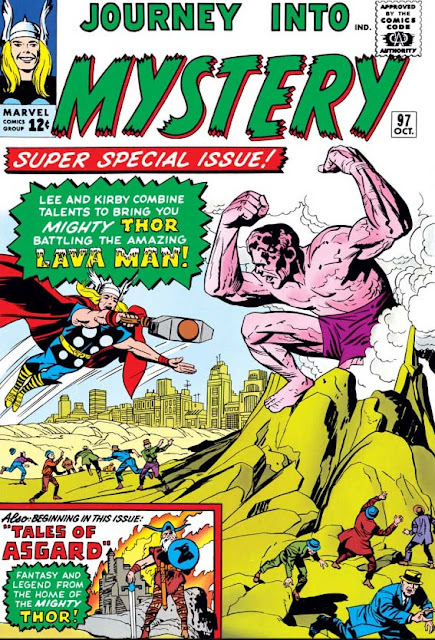 Not that he ever left, of course; he created the character with Jack Kirby back in issue #83, and he's been plotting the stories the entire time, with just the scripting duties being written by someone else (Larry Lieber first, then Robert Bernstein for the last spell). But starting with this issue, Stan takes over the writing in full, and settles in for a lengthy run of doing so - till Thor #192, in fact. Wow! The first thing Stan does, of course, is ramp up the melodrama. And if that's not enough: Jack's back! Perhaps to mark the beginning of Stan's new dedication to some of Marvel's lesser-tier characters, Kirby comes back for this one issue to illustrate the main story - the first time he's been back on the book since issue #89. After this, we'll have a three-issue stint of Don Heck's artwork on the main story, before Jack returns for good with issue #101, beginning an uninterrupted Lee-Kirby run on the character which will last until issue #179. The Lava Man may not be a very inspired idea, but his visual design certainly is. Just look at all those shadows and crags! Satisfied yet? Too bad. Because also beginning this issue is a new series of 5-page backup stories, the justly lauded "Tales of Asgard"! One of the frustrations with Thor's first year of comics has been the wasted potential; despite the richness of story ideas to be found in a pre-existing mythology, in these early days he's been just Random Superdude in a Cape, facing the likes of comedy wizards and mafia mugs. From here on out, though, we'll be privileged to receive a new short story drawn from the Norse mythos in every issue, all the way through #145! but with the simple lives of the Ancient Norse, telling stories to each other. 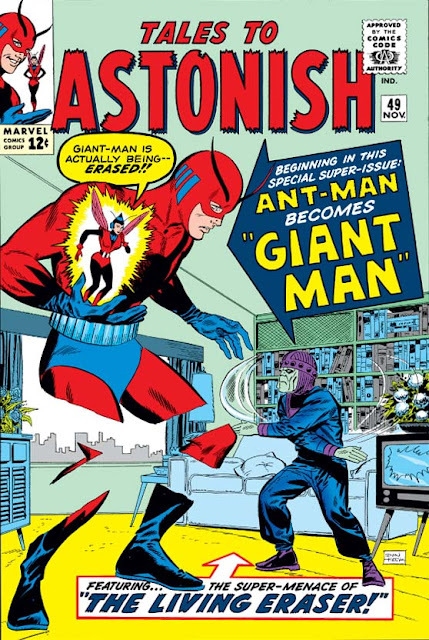 If you haven't figured it out by now, this issue is decidedly important for kicking off what's generally acknowledged to be one of the greatest runs in the Silver Age of comics - and by the powerful team of Stan Lee and Jack Kirby, one of the most important pairings in comics history. 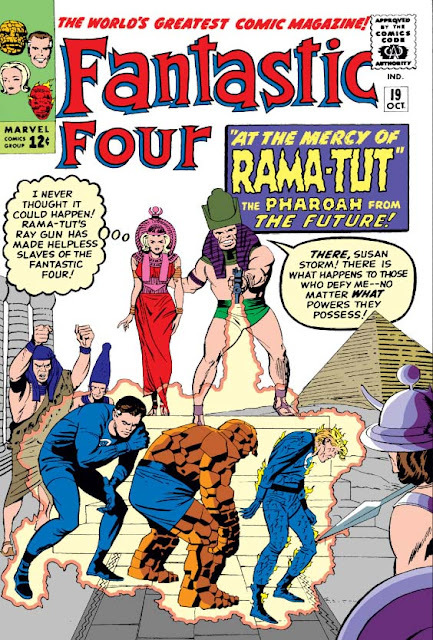 When comics fans, critics and historians talk about Jack Kirby, and the Lee-Kirby team, they always point to the first 102 issues of The Fantastic Four as being an unparalleled height that's only rarely been approached since. The second-most acclaimed of their works, however, is always their run on Thor ... and I'm incredibly excited to see that start to take shape. Okay, I know the chances are incredibly unlikely, but ... can we get some more Magic Cow? Please? We don't get nearly enough of those in comics. In this issue we meet Professor Vanko, the Crimson Dynamo. Yes, that's "crimson" as in another "red" enemy. The Cold War was in full swing, and the threat of communist invasion is one we've seen in these early Marvels time and time again. And yet, despite having an origin and creation that's neither original nor creative, he would be the first Iron Man villain who would really last, and would plague Tony Stark in one form or another for decades - even outlasting the 1991 collapse of the Soviet Union which spawned him. 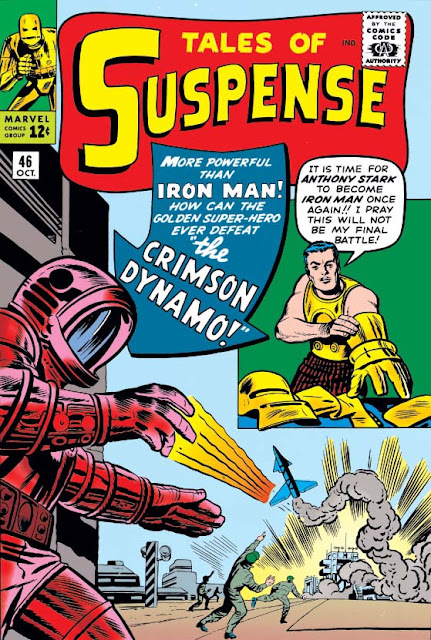 Though I've read the words "The Crimson Dynamo" for years, it never occurred to me to wonder about his name. 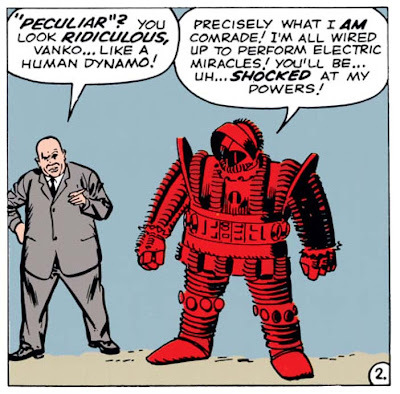 And that's because in later incarnations he's as much a guy in an armored suit which can seemingly do anything - fly, fire weapons, heighten the wearer's strength, etc - as later versions of the Iron Man will be. 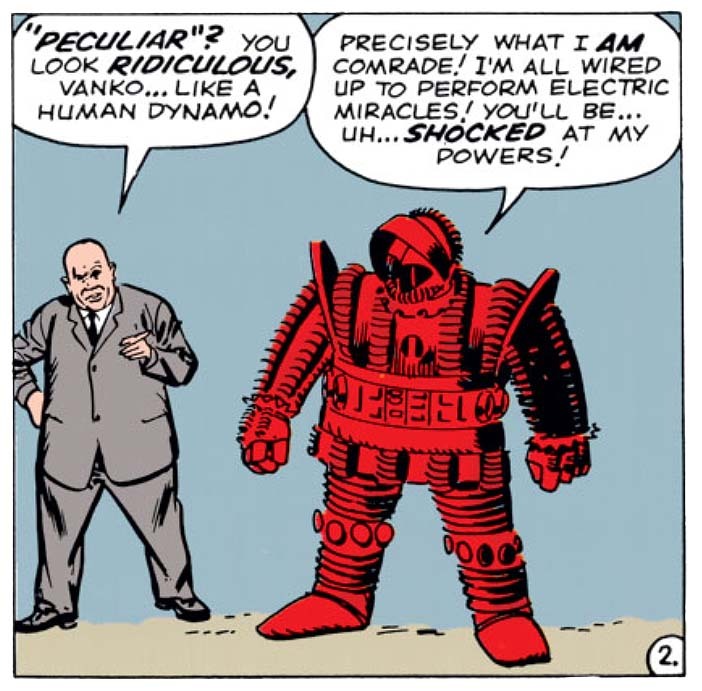 In these more limited early models, however, it's interesting to find that this new villain was named as such because the suit has the power of an electrical dynamo. (Impressively, this is even conveyed in the artistic design itself, whereby the ridges on the suit imply the coils found on such a generator!) So while the armor does protect the wearer from harm, its main use is in manipulating electrical components - which he makes use of by sabotaging Tony Stark's various arms development plants around the country. And suddenly, Stark finds the American government threatening to pull all his contracts if he can't deliver, and even wondering if Tony is a Red himself! I think we can safely pinpoint the moment his leader decided to off him. Hey kids - it's Time Travel Time! And it's spurred in a most unusual way, for when Reed & Sue visit a museum for his research on Egyptology, he spies a set of hieroglyphics which shows a radioactive herb capable of curing blindness. (Quite how radioactivity is conveyed in a hieroglyph is unclear.) Realizing that the secret to this mystery could benefit both the world and the Thing's blind girlfriend Alicia, Reed whisks the team off to ancient Egypt! Not only is this further proof of the cementing of Alicia as a new part of this most unusual family, but it also shows further evidence of Stan's commitment to listening to his readers. "If Reed is so smart," the average reader has always wondered, "then why can't he cure Alicia's blindness?" Only a year after she was first introduced, Stan's endeavoring to answer that very thing. You've gotta hand it to him: That guy sure knows how to make an entrance! 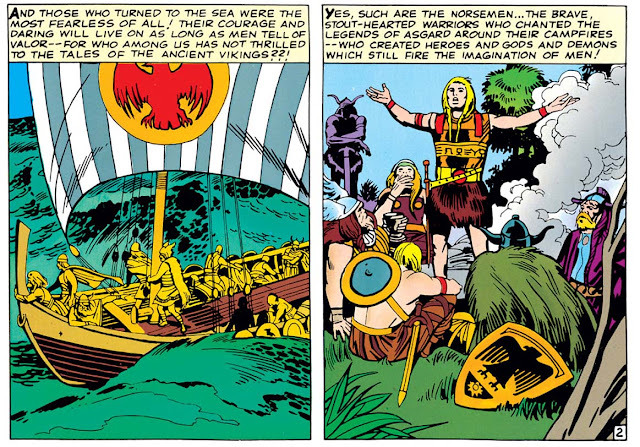 In any other comic, the writer might have made up some all-new brand of hokum to whisk his heroes thousands of years back in time. But here, with Stan writing the book? No need! After all, the FF have already experienced the wonders of time travel, the very first time they faced Doctor Doom. With Stan's realization over the past year about how much their readers responded to a sense of continuity and references to past stories, it's an easy leap to have the FF simply head over to Doom's castle (now abandoned) and utilize the time-travel device he previously used to send them back for Blackbeard's treasure. 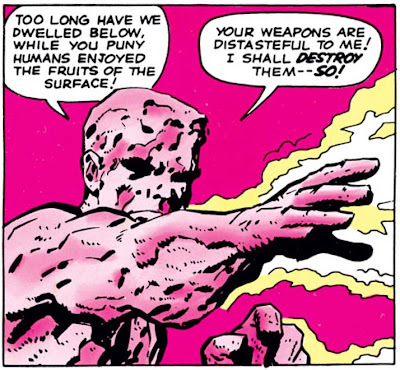 Kirby often employed this technique, showing the same scene changed over time. And marvel at how The Thing turns back to human, almost as if by magic...! Finally, a fun bonus in the issue is finding in the letters page a piece of fan mail from 16-year old Steve Gerber - and surprisingly, complaining about the art! 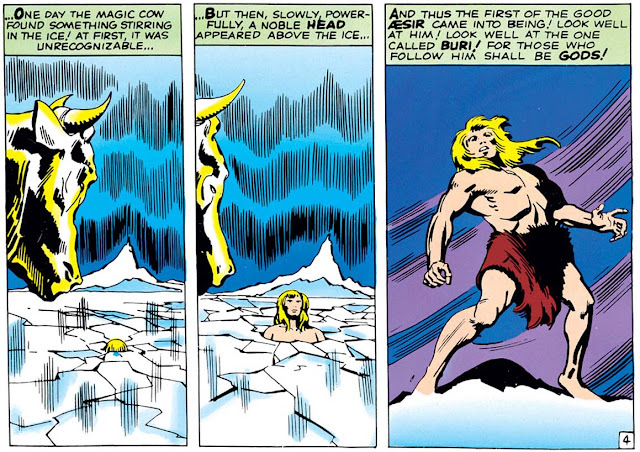 "I've never seen a worse artist combination than Kirby and Ditko," he grouses about FF #13. "Both are great alone, but please, let's not team them up again." The estimable Mr. Gerber passed away in 2008, and his talent is sorely missed - but his legacy lives on, through his own creations such as the enduring strangeness of Howard the Duck, as well as especially memorable runs on The Defenders and Guardians of the Galaxy. And hey, I figure if someone as talented as Steve could be so drastically thrown by his first glipmse of the Kirby/Ditko pairing ... perhaps my own reaction to the same can be forgiven too! 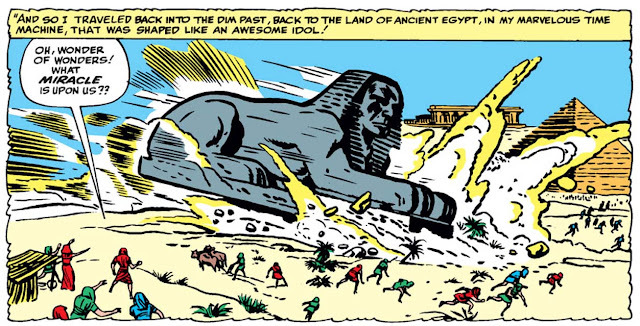 And off the Pharaoh goes, towards a chance encounter with the FF's greatest foe. 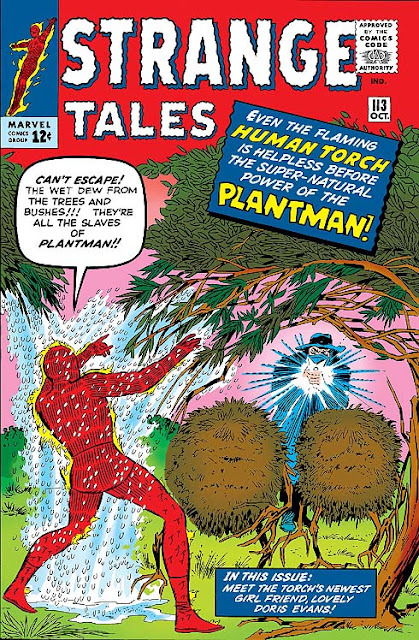 In this issue: The Human Torch fights the menace of a mad gardener! Yes, really. When plant-wrangler Sam is abruptly fired for neglecting his regular duties in lieu of an invention to increase the intelligence of the flora, he swears revenge on his erstwhile employer (and, by extension, humanity). So when a freak lightning bolt strikes his previously-ineffective device, causing the plants around him to respond to his every command, of course he sets to robbery and needlessly engages a world-known superhero in combat. By the end of the story, Johnny has turned the plants against their master, but the Plantman is seen to escape - cleverly hiding in a hollow tree trunk. Clearly, Stan must have thought they'd struck gold. And yet, shockingly, the Plantman would be back - in fact, dozens of times! Beyond this debut of yet another all-new, all-ridiculous villain for the Torch, this story is also significant for introducing Dorrie Evans, Johnny Storm's first real girlfriend. Honestly, in these early days the Human Torch rarely got much of a personality beyond the shorthand sketch of "teenage hothead", so even the cursory attempt to flesh out his character is a welcome relief. And while her shrewish attitude and unimpressed reaction to his typical grandstanding is a ham-handed stab at broad comedy (or "broad" comedy), its unexpected side effect is an added glimpse into his head as he reflectively wonders: Does the fact that she's always asking him to flame off and settle down around her just annoy him? Or does her sole interest in his normal side, unlike all the other girls who gush over his fame and flame, actually leave him intrigued? Little could the Plantman dream of the imitators who would eventually follow.